Ringing in the New Year - with a Sardine drop? 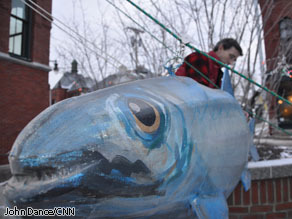 For the fifth consecutive year, the “Great Sardine and Maple Leaf Drop” will ring in the new year in Eastport, Maine. The “Great Sardine and Maple Leaf Drop” began as a small New Year’s Eve event, but has evolved into a celebration attracting locals and tourists alike to the sleepy New England town. In homage to both the U.S. and Canada, two drops take place, a maple leaf at 11 p.m. ET (Midnight Atlantic) and a sardine at midnight ET. 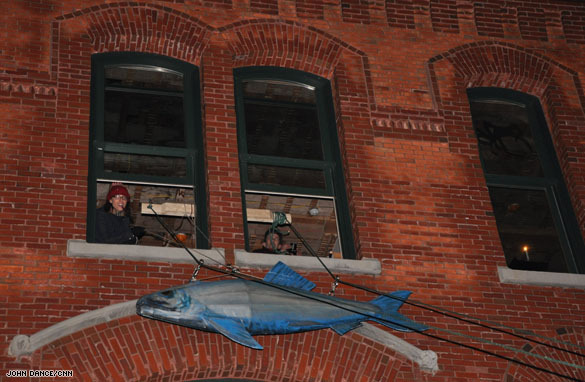 The Tides Institute & Museum of Art in downtown Eastport is host to the event each year, lowering the leaf and fish from its third-story window. The building is the former Eastport Savings Bank, built in 1887. 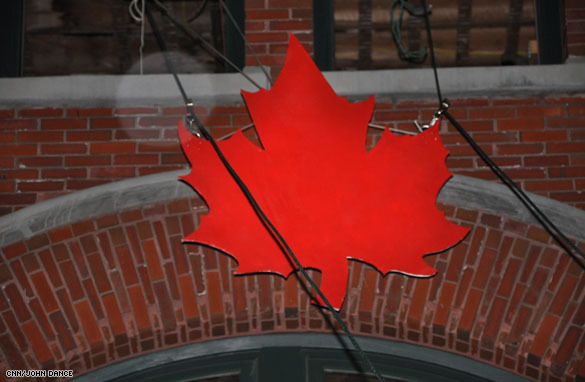 A giant red plywood maple leaf is first connected to a pulley system and is then lowered from the third floor window of the Tides building at 11:00 p.m. ET. The leaf is a nod to Eastport’s Canadian neighbors who celebrate New Year’s on Atlantic Time. Then, at midnight, an approximately 8-foot-long sardine—made from canvas stretched over a cedar and plywood frame—is lowered. 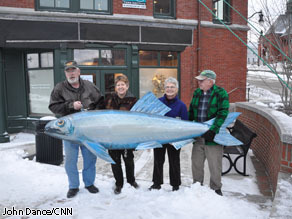 The giant fish, designed and built by area artist Bill Schaefer, pays homage to the town’s fishing and canning past. Bill also has the task, and privilege of lowering both the maple leaf and the sardine. Throughout the evening festivities take place such as live brass band, the singing of Oh, Canada and Auld Lang Syne, and eating and drinking at local restaurants. Eastport, which has a population of approximately 2,000, is the easternmost city in the continental United States.